For the month of December as a treat to my students, I have decided to switch off from my typical reading program and conduct good, old-fashioned literature circles. They may be old-fashioned novel studies, but instead of having my students journal in notebooks and taking home a stack of them every night to grade, I have instead decided to conduct all my journaling and grading online. I am using Edmodo, a site that I have recently sung the praises of. Having used other online services (Moodle), I had my doubts about Edmodo’s limitations, since it runs itself more like a social network than a traditional website. Every day, my reading groups are given a few chapters to read and a few questions to journal upon. 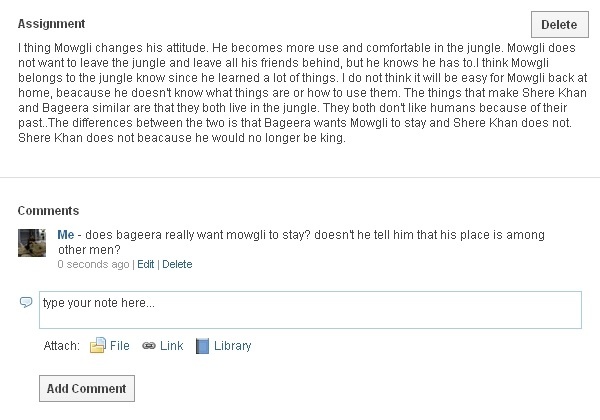 After their reading, they post their journal responses to Edmodo, which I then grade, giving my students prompt feedback. I have noticed a few things about running my reading program using Edmodo. For one thing, I get fantastic written responses from many of my students. That said, many of the same students who struggle to write in my regular classroom also struggle to get their work in when online. If you think that writing on a computer will solve all your late work problems, you are wrong. It does allow you to keep better track of missing work, although the excuse of ‘my computer ate it’ does come up. Edmodo helps me get on top of my student’s reading responses, to provide quick feedback, and to make good assessments of student understanding and comprehension that goes well beyond multiple-choice tests. Students write mini essays, conduct polls, and respond to each other in a way far simpler than any other service I have used.